It is your “home away from home”, and you want to feel as protected in it, as you do in your actual home. The basics that every RVer needs– Liability, Comprehensive, and Collision– are a good place to start. 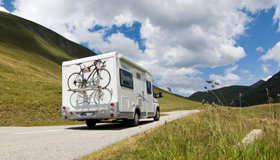 There are benefits available on an RV policy, which are not available on a standard auto policy. Get the full value (not depreciated) if you need to replace damaged parts, including awnings and tires, which are covered by Comprehensive and Collision. Earn lower deductibles for each claim-free policy period, with a Disappearing Deductibles feature. Comprehensive and Collision coverage which include Pet injury coverage, Emergency vacation expense coverage, trailer coverage, and Vacation Liability Coverage. Roadside Assistance, with no out-of-pocket expense. Full Timer’s coverage. This will give you coverage similar to a homeowner’s policy if you live in your RV full time.